A 300-mile long garage sale that begins in Grand Island and extends into the Nebraska Sandhills. Bring your trailers to haul home your treasures. They missed it the first year. The second year, they were driving northwest toward the Sandhills in the pre-dawn hours with the goal of making it all the way to Burwell, Nebraska. Their first stop was in Cotesfield, and they estimate that they stopped more than 40 times before getting to Burwell. “You see those bright orange signs and your heart just starts to palpitate,” says Jane Thorngren. Nebraska’s Junk Jaunt turns 13 this year. The treasure hunt begins in Grand Island and follows the Loup River Scenic Byway and part of the Sandhills Journey Scenic Byway northwest into the Sandhills. It’s roughly 300 miles total through beautiful, hilly cattle country. Community centers set up tables, churches serve homemade lunches, and barn doors are rolled back to reveal everything from antique implements to automobiles. Small Sandhills communities mobilize to create temporary centers of bustling commerce: Cairo (pronounced with a long A so as not be confused with its Egyptian counterpart), Dannebrog, Loup City, Sargent, and many more. Antique dealers arrive early from the east and west coasts, often picking through the antique shops in downtown Grand Island during the days leading up to the Junk Jaunt. Other people are on the hunt for unique items to put the final touches on their interior designs. 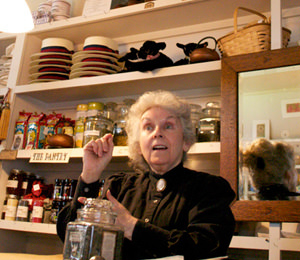 A few years back, a Nebraska woman was shopping specifically for items related to a new business venture. The Plucky Wicked Pickers do it for the fun of it. Friends offered their cabin as a place to stay during the Junk Jaunt, and the pickers returned the hospitality with goofy gifts. The relationship soon turned into a competitive scavenger hunt. Two teams scour as many of the 500-plus registered vendors along the route as they can. Tina Reichert is the team’s driver. The minivan is emblazoned with large Plucky Wicked Pickers magnets. Stacia Mason is often on the phone calling regular Junk Jaunt sellers asking if this year’s inventory includes any of the items from their list. Punky Brewster memorabilia has eluded the teams for multiple years. After not finding any Punky items for two years, the teams continue to hunt for anything Brewster. The Plucky Wicked Pickers also hunt annually for the best sloppy joes along the Junk Jaunt. Scotia has been the perennial favorite, although in 2016 Thorngren and Reichert found a booth in Cairo that gave Scotia a run for its money. Elba has great enchiladas, and St. Paul has wonderful maple-bacon long johns according to Thorngren. Homemade cuisine is cooked up all along the route, both sweet and savory. The three women occasionally sign into vendors’ guest books under pseudonyms such as Lady Gaga and Patsy Cline, however the same guest books’ more accurate signatures confirm the event’s nationwide appeal. As seasoned Junk Jaunters, they have met people from all over the United States and Canada. The pickers also testify to the hospitality of Nebraska folks, offering meals and places to stay along the way when they have been needed. “I really think you’re missing out on Nebraska if you don’t get up to the [Sandhills],” Reichert and Thorngren say. “This part of the country is so beautiful and the people are so nice.” They note in particular the North Loup River Valley, adding that the area is now home to wineries and brewpubs they intend to seek out. “It’s the place to be at the end of September, on the Junk Jaunt,” Thorngren concludes. Head to Stuhr Museum's Railroad Town and relive life in the 1890s at this top living history museum. Shop for antiques along downtown Grand Island's historic streets. 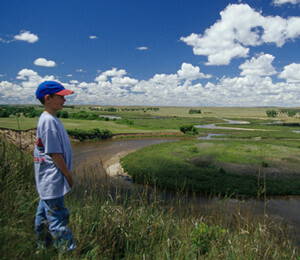 Don't miss the beauty of the Sandhills Journey Scenic Byway in your rush to find treasures along the Junk Jaunt.